We chose this cruise for it&apos;s itinerary and value - nine destinations in 14 days. The Azura proved to be a very decent ship. The Atrium could be bigger, for dancing and activities, but is nicely designed. The Glass House was a highlight, cleverly designed and a different sort of bar, where sometimes on cruise ships everywhere feels pretty much the same, but the Glass House is a bit more sophisticated and designed to fit plenty of people in but without ever feeling packed. Does nice food at a reasonable extra cost. Drink prices across the ship are reasonable too - wine at the tables from £17 a bottle is very good these days, and beer no dearer than pub prices. Brodies pub was always buzzing if you like that sort of thing - the casino attached is fine but not big. Malabar and Manhattan bars were always showing some live entertainment or movie*. Freedom dining in the Peninsular or Meridian restaurants was good if unexceptional - not the best or the worst we&apos;ve had. Met lots of interesting people by sharing tables.Service was fine, but not perhaps as personal as when you do fixed dining and get to know the waiters. Sindhu restaurant (£20 extra each) was excellent, particularly for veggies. On deck, we never felt like there were 3000+ on board. I didn&apos;t appreciate from pictures why there were two separate pool areas - from the quiet one with the Sea Screen* you can&apos;t hear the louder one where all the music and bands play, so you have a choice according to your mood. *We were informed a couple of weeks before sailing that the outdoor screen on deck would be out of action for our cruise. It didn&apos;t exactly ruin our holiday but we were extremely disappointed that they couldn&apos;t get this right for the Christmas cruise - the priciest of the year. Rumours varied as to how long they had known it was faulty. I don&apos;t think this would happen on other lines. A negative for us was the regular PA announcements at 7am every time we docked (9 days out of 14!). We&apos;ve never experienced this before - we normally enjoy a lie-in on our holidays, but no chance on Azura I&apos;m afraid. Even though the announcements were in the corridor and not in the room, they were loud enough to hear inside. 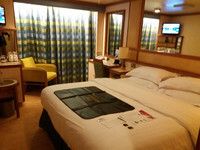 This will make us think hard about choosing P&O again, which is a shame, because it was otherwise very good. Other negatives? As non smokers we&apos;re not keen on the policy of letting people smoke on the starboard side of the pool deck - it&apos;s not like the smoke stays on that side. But I suppose a lot of P&O customers appreciate it. For a big-ish ship, P&O seem to have created the pokiest and most awkward buffet restaurant at sea, compounded by their unique insistence on providing trays for confused people to shuffle around the aisles with, while every other line just lets you grab a plate and move around much more easily. Otherwise the food and drink was no different to any other ship. One highlight was the shore excursions, which were much cheaper than some lines like Princess. We went kayaking, snorkeling and river tubing and enjoyed them all. The ports we stopped at were good, although if you didn&apos;t book an excursion in some of them there wouldn&apos;t be a lot to do after half an hour (Tortola, St.Vincent...) We don&apos;t go to see many shows - the Adele tribute Helen Ward-Jackson was excellent and the Tina Turner tribute pretty good too, but the &apos;Astonishing&apos; magic show was poor - the tricks were obvious and the sound quality of the singers was harsh. Embarkation in Barbados was as good as it could be at 8pm on a warm evening after a delayed 9-hour flight. P&O are always well organised at getting everyone on/off properly. Leaving was fine, but due to the late flight home hanging around from 8am until 3pm would have been a bind if we hadn&apos;t discovered a long lost friend in Bridgetown who invited us over! We chose this cruise for it&apos;s itinerary and value - nine destinations in 14 days. The Azura proved to be a very decent ship. The Atrium could be bigger, for dancing and activities, but is nicely designed. The Glass House was a highlight, cleverly designed and a different sort of bar, where sometimes on cruise ships everywhere feels pretty much the same, but the Glass House is a bit more sophisticated and designed to fit plenty of people in but without ever feeling packed. Does nice food at a reasonable extra cost. Drink prices across the ship are reasonable too - wine at the tables from £17 a bottle is very good these days, and beer no dearer than pub prices. Brodies pub was always buzzing if you like that sort of thing - the casino attached is fine but not big. Malabar and Manhattan bars were always showing some live entertainment or movie*. Freedom dining in the Peninsular or Meridian restaurants was good if unexceptional - not the best or the worst we&apos;ve had. Met lots of interesting people by sharing tables.Service was fine, but not perhaps as personal as when you do fixed dining and get to know the waiters. Sindhu restaurant (£20 extra each) was excellent, particularly for veggies. On deck, we never felt like there were 3000+ on board. I didn&apos;t appreciate from pictures why there were two separate pool areas - from the quiet one with the Sea Screen* you can&apos;t hear the louder one where all the music and bands play, so you have a choice according to your mood. *We were informed a couple of weeks before sailing that the outdoor screen on deck would be out of action for our cruise. It didn&apos;t exactly ruin our holiday but we were extremely disappointed that they couldn&apos;t get this right for the Christmas cruise - the priciest of the year. Rumours varied as to how long they had known it was faulty. I don&apos;t think this would happen on other lines. A negative for us was the regular PA announcements at 7am every time we docked (9 days out of 14!). We&apos;ve never experienced this before - we normally enjoy a lie-in on our holidays, but no chance on Azura I&apos;m afraid. Even though the announcements were in the corridor and not in the room, they were loud enough to hear inside. This will make us think hard about choosing P&O again, which is a shame, because it was otherwise very good. Other negatives? As non smokers we&apos;re not keen on the policy of letting people smoke on the starboard side of the pool deck - it&apos;s not like the smoke stays on that side. But I suppose a lot of P&O customers appreciate it. For a big-ish ship, P&O seem to have created the pokiest and most awkward buffet restaurant at sea, compounded by their unique insistence on providing trays for confused people to shuffle around the aisles with, while every other line just lets you grab a plate and move around much more easily. Otherwise the food and drink was no different to any other ship. We don&apos;t go to see many shows - the Adele tribute Helen Ward-Jackson was excellent and the Tina Turner tribute pretty good too, but the &apos;Astonishing&apos; magic show was poor - the tricks were obvious and the sound quality of the singers was harsh. Embarkation in Barbados was as good as it could be at 8pm on a warm evening after a delayed 9-hour flight. 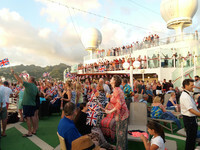 P&O are always well organised at getting everyone on/off properly. Leaving was fine, but due to the late flight home hanging around from 8am until 3pm would have been a bind if we hadn&apos;t discovered a long lost friend in Bridgetown who invited us over! Excellent cabin, clean & tidy, just enough space, balcony good for two loungers and a small table. Serviced well by Cliford. No complaints at all. The shower was probably a bit small for some - I&apos;m only 5&apos;7" and medium build, a larger person would struggle a bit. Nice to have a kettle in the room, and UK sockets. Storage space was good for two. Straight off the ship onto a catamaran and back out to see to snorkel on a reef. Great staff again, lots of free rum punch. Only slight complaint was only about 15-20 mins snorkelling - would have liked a bit longer. Walked into town from the ship to the boardwalk by the river and found a bar for a welcome drink on our first day. Good guides and a great experience, kayaking up and down North Creek and handling some of the local wildlife. Back at the port, the &apos;resort&apos; was the best organised of all our stops, despite this being probably the smallest island. A great beach, bars, shops etc., all meters from the ship. Long drive up into the hill/rainforest - not for the travel-sick. Tubing was great, but could have been a bit longer. 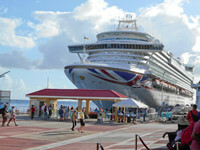 We like St.Maarten although we heard some others say it was too loud and street sellers too pushy. We wandered along the front and then the shopping street behind. We always visit Max at Joe&apos;s Jewelery when we&apos;re here - can&apos;t fault the service and value and genuine products. Another where an excursion of some sort would be a good idea. Found a nice bar not far from the port.